CNAME records are incredibly handy but have the limitation of not being usable for the apex (or root) of a domain. This is also sometimes called the "naked domain". In the above screenshot, widgets.com is the apex domain. ALIAS records do not share this limitation. In fact, this is one of the primary reasons that ALIAS records were created. 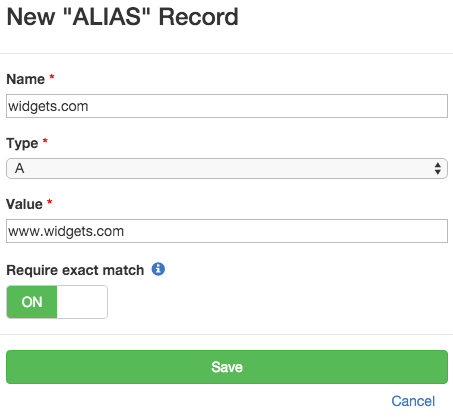 ALIAS records require a single DNS lookup. CNAME records might require multiple lookups. ALIAS records alias one domain name transparently to another. In other words, if you do a DNS lookup on an ALIAS record, the response will contain the aliased record's values, without any reference to the fact that an ALIAS is in place. By contrast, if you do a lookup on a DNS record that is a CNAME, the DNS resolver will sometimes need to do two or more queries. For example, if you lookup the track.dnscheck.co A record, what gets returned is a CNAME record pointing to mandrillapp.com. Your DNS resolver will then need to query the mandrillapp.com A record unless an upstream resolver already did this for you. If you create an ALIAS record which maps the www.widgets.com A record to widgets.com, then this mapping only applies to A records. CNAME records, by contrast, apply to all record types. If you create a CNAME record which aliases www.example.com to example.com, then all example.com DNS records get aliased to www.example.com. This could include A, AAAA, MX and TXT records, for example. ALIAS records are non-standard. They aren't specced in any RFCs and are not supported by most DNS servers or hosting providers. ALIAS records also don't have a standard name at this point. Other names, like "ANAME" are sometimes used for DNS records which offer similar functionality. Those DNS hosting providers who do support ALIAS records differ in their implementations. For example, some DNS providers support ALIAS record functionality for A and AAAA records only, while others support more record types. DNS Made Easy calls these DNS records "ANAME records"
easyDNS calls these DNS records "ANAME records"
Most DNS providers support CNAME records. With this option On, the records returned when looking up the Name must exactly match the records returned when looking up the Value. With this option Off, the records returned when looking up the Name must be a subset or exact match of the records returned when looking up the Value.